CURRENT SPECIALS: SOIL, HEAVY WASTE & GREEN WASTE AVAILABLE AT DISCOUNTED PRICES. Our commercial skip bin hire is an affordable solution for professionals working on Gold Coast sites who need a solution for removing rubbish. 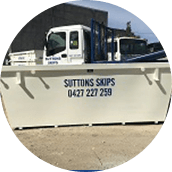 If you’re looking for an affordable and professional skip bin hire service on the Gold Coast for construction debris, contact us at Suttons Skips. We’re always happy to give a free quote for any waste disposal or rubbish removal job that requires skip bin hire. We offer short-term and long-term skip bin hire for domestic, commercial and construction purposes. All our skip bins have wheelbarrow access. 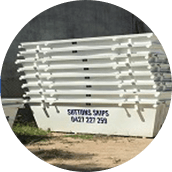 We are a Gold Coast based skip bin hire company. We hire skip bins for domestic use, commercial use and for construction sites. If you need to remove rubbish or dispose of waste, we have the right skip bin for you. Our fleet of 60 skip bins are cleaned and sanitised before we bring them out to you. We have 4 sizes and if you’re not sure which one will suit your needs, just ask. We’re here to help and our friendly driver can even give you a hand with heavy or bulky items that you need to dispose of. Our skip sizes are available in 2m³, 4m³, 6m³ and 8m³. At Suttons Skips, we are keen to make sure we are doing our bit to take care of the environment. We strive to be as environmentally friendly as possible when it comes to Waste Disposal and Waste Recycle. For this reason, we cannot accept items such as asbestos, paints, chemicals, oils, nappies, empty chemical containers, hazardous materials, CFC (compressed fibrous cement) sheets, or any other dangerous goods. By complying with these rules, you can help us look after your best interests and the long-term protection of our environment. For safety, our skip bins should be filled no higher than the rim. We give you a quality service at an affordable price. We can help you with whatever you need when it comes to skip bin hire. Talk to our friendly team about your requirements and we’ll make sure you get the right skip for your needs. We operate Monday to Friday 6:00am to 5:00pm and between 7:00am and 11:30am on a Saturday. Call us for skip bin enquires, a free quote, or for bookings. 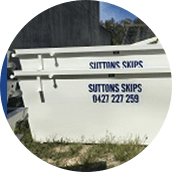 We will deliver and collect skip bins to any site or property on the Gold Coast. We used Suttons Skips for our garden clean up in mermaid waters. We had 2 bins and Clint saved us a lot of money and was so helpful. Clint gave me a great price , & service. Transaction was easy, you can't go wrong with these guys. 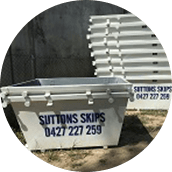 © 2017 Suttons Skips. All Rights Reserved.